If there’s one good thing I got from my German ancestry, and I would maintain there might be more than one, it is a work ethic. My work ethic remains alive and well, as do I currently, and we both march through this life together. In recent years my attitude toward work has evolved into the following: if I’m going to do this physical work on a daily basis, I may as well treat it as something more than mere work. I’ve come to treat it as sport, and it serves me well. That allows me to eat like an athlete in training, take care of myself like a thoroughbred race-horse, sleep the sleep of the dead every night, and take pride in knowing I’m in better shape now than when I was in my 40’s. I read a novel in the early 80’s titled: The Thornbirds. It was set in Queensland, Australia, in the late 1800’s, when it was settled. I had an interest, because I would soon be traveling there. I remember two characters from the novel quite vividly, two outback, redneck (literally) Aussie blokes who both started sugar-cane plantations, in hot, humid, jungle-like Queensland. They developed an attitude toward work as a sort of survival strategy: they competed with one another to see who could out-work and out-produce the other. They turned their brutally physical labor into a game, a sport, a competition, and to them work became strangely fun. So if you see me smiling or joking around with one of my workers, you can know that I’m truly enjoying myself in the pursuit excellence in your yard. I must take some joy in everything I do as much as I do my work, my business, or what kind of wretch would I be? No other answer, for me, than work as sport. With the advent of spring come the inevitable and unavoidable road restrictions in our part of the world. Road postings, weight limits, people call them by a number of monikers, but essentially they mean the same thing: it just got tougher to do the vast majority of jobs. Typically these postings go on in mid-March, when the spring thaw is getting going, and they last 3 to 6 weeks, on average. A lot of factors can enter into the mix to further complicate matters, from the temperature variations during this time, to amounts and varieties of precipitation. The bottom line in this discussion is that while these limits are in place, it becomes much more difficult and complicated to, potentially, move equipment in or out of a job-site, or, more likely, to move materials in or out of a given site. Landscaping can be a very truck-intensive proposition, requiring many trips in or out with stone, gravel, fill, pavers, etc. When one is severely limited by the amount of weight you can place in the back of a truck, the job just got more difficult and costly. Here’s a tactic that can work if employed early enough: with some advance planning, haul in the materials before the roads are posted. That may not help with material that needs to leave the site, excess fill, debris or demo and the like, but it may just tip the scales of whether a given job is feasible, from a standpoint of necessary trips in or out, to the do it early rather than do it later side of things. Call early and let’s talk about it. Budgets… what can we say about them, other than they have their place in our lives. This is a reality that we, as a design/build landscape company, have to deal with on all projects. In the past the process used to go like this: we would come in and have a meeting or two with a prospective client, and would take a stab at designing in what we felt the scenario called for, maybe a couple of different options to provide some choice for the client. Typically a couple of choices, maybe up to three, in a variety of price-points. But there can be a better way, one that removes a lot of the guess work from the entire process, and puts everyone on the same page in the beginning. That process goes as follows: we have a meeting or two, and our designer asks you what your budget is, so she can design accordingly. It doesn’t have to be an exact figure, maybe a range, but at least it gives us an idea what is possible, what direction or directions to consider moving, or to perhaps rule out. But asking a potential client’s budget is not always the easiest, most logical step in the process. Some people are guarding that secret like national security depends upon it. To give away that information would be to lose the upper hand in the hard fought negotiating game that inevitably accompanies these kinds of decisions. You can kind of tell who those people are not far into the process, and with them it may be impossible to ask that kind of question—maybe they’re too ‘old-school’. I’m fine with giving those folk a bid the old-fashioned way—kind of a shot in the dark method. But something gets lost in that process, and maybe if we’re well beneath that well-guarded secret number, we could have done and designed so much more to fill in around the edges, or given them some flair or extra-ordinary flourish on the design that would have made it really pop. So there you have it; much of the time we ask that difficult question, sometimes we don’t, when the hints are too obvious, or when we’re competing with a number of other contractors for a job (see article titled: “Competition” at other tab on website). Oftentimes those competitive situations are all about price, with a plan or design already in hand, and the question doesn’t make sense. But if you’re on the receiving end of this question from us, rest assured that our motives are good, and that we consider it a good sign, and a good thing, that we feel free to ask you that question. We ask you to remember, please, don’t shoot the messenger. In case you haven’t been paying attention, the real-estate market has rebounded significantly in the last couple of years. After the crash of the markets in ’08, and the resulting “Great Recession” that depressed values beyond what might have been considered reasonable, we are now making up lost ground. That is, by every homeowner with skin in the game, a good thing. As a small business owner whose business is somewhat reliant upon the confidence levels of said homeowners, I have another good reason to like this development: it’s good for business. I have learned a few things from over 20 years in the landscaping business, one of which is that when people’s largest investment in this life is losing value, they’re less inclined to spend money on improvements to that investment. And if people have learned anything from the economic and financial turmoil of the last 6-7 years, it’s that years of increasing real estate values do not guarantee that situation will continue. What can go up, can and often does come down. When it comes to investing in your home there are two schools of thought, currently, that make sense to me: one is to mostly ignore what the market is doing and to make your home into a retreat. The second, is a variation on that theme: to make your home into a retreat, but do it with an eye toward the market, and things that add value. Another way of putting that might be: don’t invest in improvements that you have no chance of recouping. Unless, of course, you know that going in, and you can afford it. The classic example would be a swimming pool; no one builds a swimming pool in our part of the world believing they will recoup that investment. They build one because they want it. So, what kind of home improvements make sense in that way? The kitchen remodel might, depending upon the home, and the existing kitchen, as well as the proposed one. Same with the bathroom remodel(s), or the addition you’re considering. Let me make another case, one that you may not have considered: re-do the outside of your home. Only if it makes sense, of course. Perhaps the biggest reason it makes sense is that landscaping gives you the most ‘bang for your buck’ of anything you can do to your home. I recently completed a remodel of my own kitchen, and it set me back about 22K. I acted as the General Contractor on the job, and did some of the work myself. 22K is a pretty good price for the net effect we achieved. But 22K spent in the realm of landscaping would be something rather over-the-top. If I separated out the money I spent on the custom cabinetry, 10K, and focused on that, how would that bolster my argument? Number one, spending 10K on landscaping is a significant amount, and could easily start and finish either your entire yard, or a large portion of it. 10K only covered the cabinets in my kitchen, not the countertops, the floor or any other necessary component of the greater whole. 10K in the landscape realm would have netted me a much greater effect, I believe. 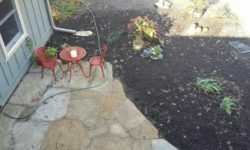 Let me give you an example: several years ago a client hired us to come in and tear out his existing plants, shrubbery, and landscape rock/edging, and replace them with new plants rock and edging. This client lives on a rural site in Grant, MN. The job took two to three days, and cost him 3.9K. The effect was dramatic, almost jaw-dropping: I have never before been as struck by the difference such a modest amount could make in a before and after sense. That house, and that job, became my poster-child for the value that landscaping can add to a residence. So, with an improving housing market, and a slowly improving economy overall, the outlook for contractors like me has improved. 2014 & 2015 look to be better years than the previous few, and I hope that pans out. If so, call early to get on my, or someone’s schedule for your project. All the best in the coming year. Perhaps you’ve noticed on some of these web pages a particular kind of stone, assembled in a certain fashion, to create a free-standing structure much like what one might see in places like Ireland, or New England. A stone fence is what I’m talking about, and they can be a very interesting and beautiful way to define or limit property lines, or one part of your property from another. We also use this stone to build retaining walls, and it’s here that I’ll let you in on a little secret: this stone is a great choice for more than free-standing fences, it also works great for retaining walls, and I’ve used it any number of times very successfully. 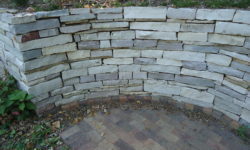 Why is this stone a great choice for a retaining wall? Number one reason (and here the secret deepens): price. This is a wall I can build for less money than any other choice of material will allow. 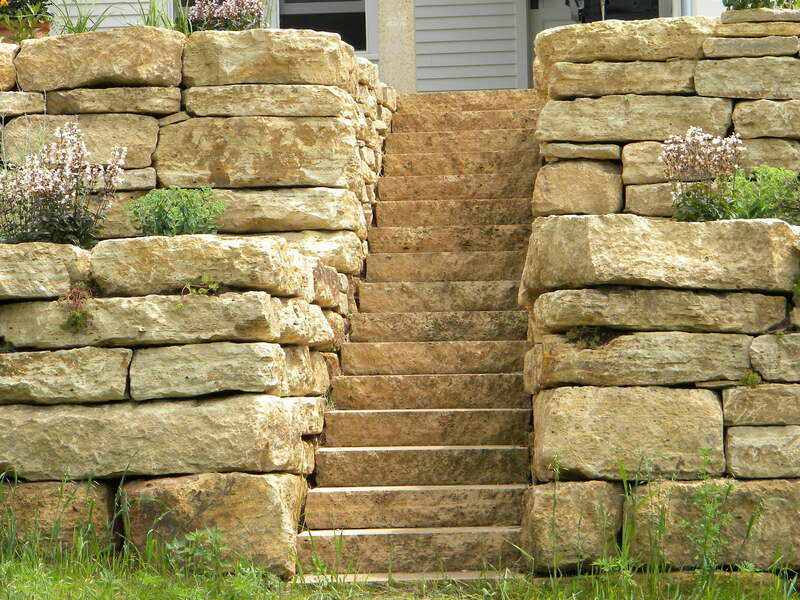 If you’re considering concrete retaining wall blocks, then the difference is very significant. 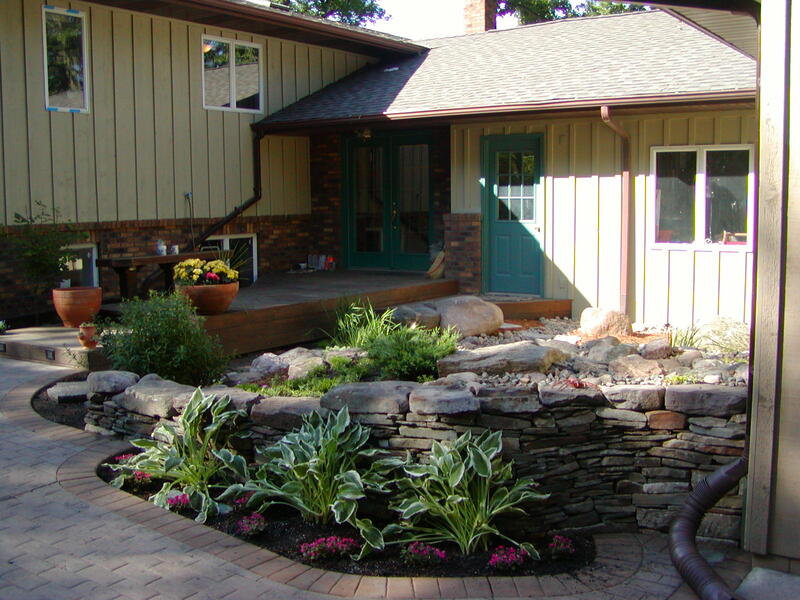 If you’re leaning toward another kind of stone, say field-stone boulders, then the difference is still great enough to get your attention. 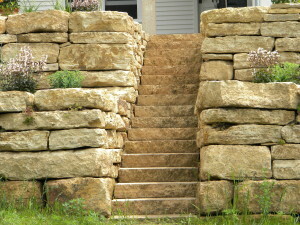 Beyond price, the aesthetics of a retaining wall are also very important. Supremely important in fact. In my (studied) opinion, a retaining wall of the same color and kind of stone is far easier on the eyes than a wall comprised of multi-colored boulders, for example, far more natural looking and likely to suggest a well-planned and conceived landscape. Of course beauty is in the eye of the beholder, as the saying goes, and questions of beauty can be quite subjective. This choice of stone isn’t going to appeal to everyone, for a variety of reasons, but rest assured that I will probably raise it as an option, especially given that I go into most meetings assuming that budget concerns are very real. 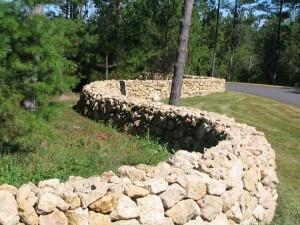 If a person is looking to make a statement with a retaining wall, this choice may or may not work; a lot would depend upon the style of house, location of wall with respect to the house, setting of house (urban, suburban or more rural, for example), terraces or planting beds around walls, etc. 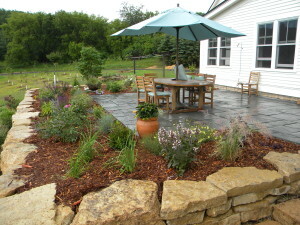 There are a lot of factors to consider, and a more experienced Landscape Contractor will not overlook any of them, where someone less experienced might make that mistake: to focus on one piece of the puzzle at the expense of the sum of the whole. The stone in question is a variety of Limestone, and is readily available in the Twin Cities and St. Croix Valley, which contributes both to its economy, as well as its attractiveness. It is a native stone, so by virtue of that and its economy it may be a good choice for you. Depending upon some of the aforementioned circumstances I may make mention of it, when discussing retaining walls, etc, or you could request we take a look. There are other factors that come into play as well, which will remain under wraps for now; rest assured that they only contribute to this being a good choice for many people. Certainly an option worth discussing. To the best of my knowledge, Outdoor Concepts is the only landscape company in the area currently using this option.